Oto was the only one still alive. Everyone else was simply and utterly gone. This had not been the way it was supposed to happen, but now, in retrospect, it seemed silly. A direct assault on the Caverns of the Lorn was a fool's errand. They should have known. Varya should have known. Now, Oto was alone, wounded, weary, and wandering the endless black reaches beneath the earth. The Lorn could be anywhere: ever-lurking and ever-famished, seeking his life-force. At any moment one of them might emerge, their amorphous forms looking like nothing so much as long, streaming tendrils of blue-black tatters. The thin skin on the surface of oblivion. It had been a long time since Oto had felt fear, but he felt it now. The gentle voice of the Master came to him, speaking across time and space. "...then, free of fault, you will lift up your face; you will stand firm and without fear." Young Oto, confused, queried the Master of the Circle. "I do not understand, Master. What does fault have to do with fear?" Bearded lips smiled knowingly, and the Ancient One sat still like a stone for a long time. Eyes like the ocean, dark blue and deep, threatened to drown the young monk. Finally, "Now, nothing. Eventually, everything." That had been many moons ago. Now Oto was the leader of his order--the same Order of the Unbroken Circle which his Master had founded--yet, he was still learning from the Ancient One. He now understood the meaning of those words, spoken so long ago. Despite foreswearing physical possessions (a requirement of his Order), Oto had been carrying many things: secrets and falsehoods; lies and evils. These things had become chains upon his soul and anchors for his spirit. These secret things--deeds done in the darkness and kept hidden from the light of Truth--had become shackles on his heart. He had forged the chains of his own fear and defeat, link by dreadful link. When he opened his eyes, the edges of the darkness had begun to move, swaying like the tattered pennants of death. The Lorn had come--and none before them could survive. 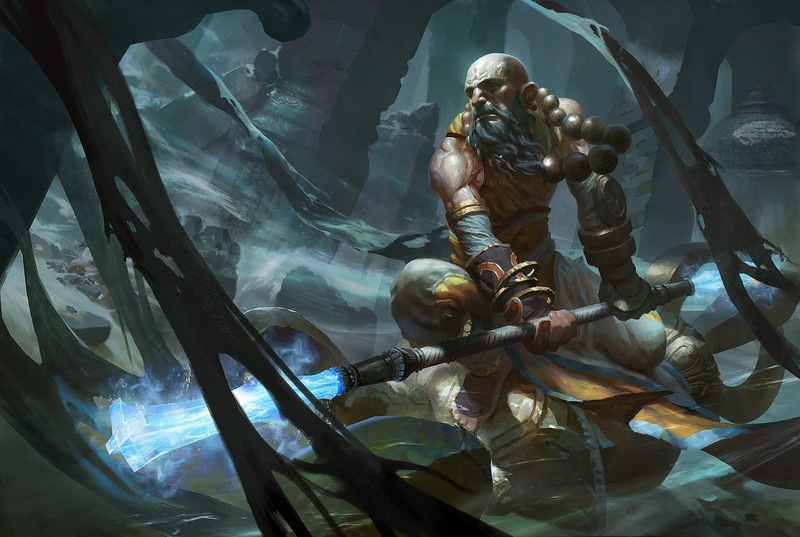 Oto stood, the ends of his monk's staff erupting into the azure light that was indicative of a Grand Master of the Order of the Unbroken Circle. Yet, brighter still was the light shining from within his soul.